A breath-taking, beautiful destination year-round, Switzerland is particularly special to visit over the festive season. The country goes beyond light displays to make the season bright with festivities ranging from musicals to markets, fireworks, skiing, and sleigh rides; you’re guaranteed to secure yourself an unforgettable experience. Swiss International Air Lines (SWISS) transports thousands of people from around the world to a country that celebrates the festive season in a magnificent way. Dr. André Schulz, General Manager for Lufthansa Group Southern Africa, comments, “When travelling to Switzerland, even greenest and greatest Grinch would find it difficult not to participate in the holiday festivities.” SWISS offers some of the best festive season activities and places for you to explore. 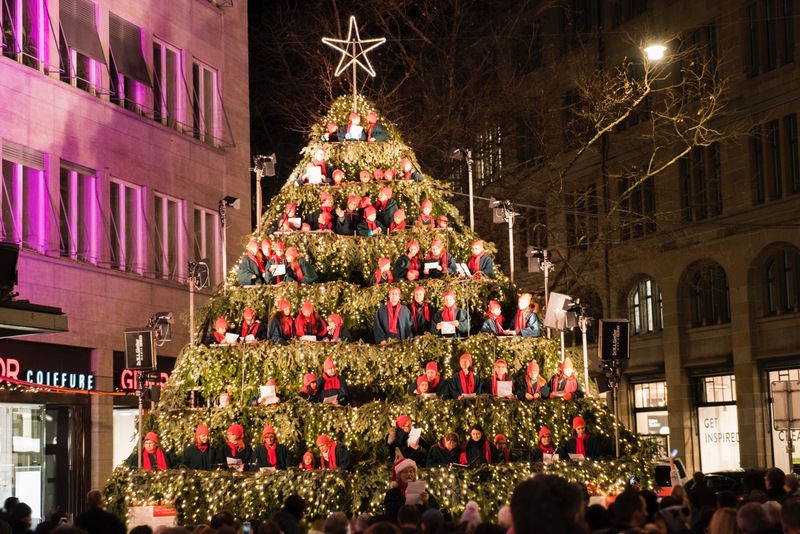 Switzerland’s capital city, and the primary hub for SWISS, kicks off the holiday season with the singing Christmas tree and stellar performances that suffuse the festivities. Standing in tiers amongst a giant tree, various choirs entertain onlookers with their rendition of carols. Rowed up on a vertical podium, the singing tree has already firmly established itself as a favourite among visitors and locals alike. Visitors describe Christmas in Basel as a cure to jetlag, focusing on the decadent Swiss food and other tempting goodies available at the bustling market. The Basel Christmas market at Barfüsserplatz and Münsterplatz is considered to be one of the largest in Switzerland, with over 180 wooden huts set up in the heart of the city’s old town. Traders and artisans offer their goods for sale in small, rustic wooden chalets, handy for shoppers who are still looking for gift ideas. 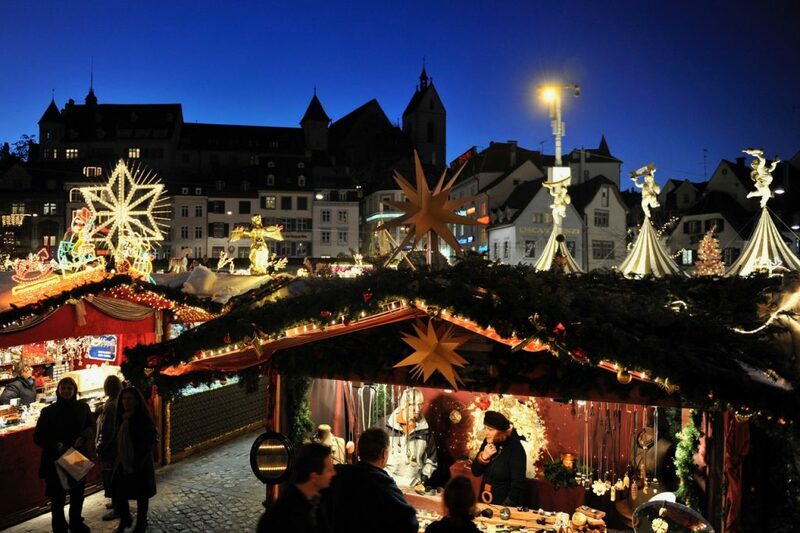 There is also a wide selection of local culinary delights including waffles, Glühwein, genuine Basel Läckerli (a type of gingerbread), delicious Swiss raclette or the popular grilled sausages. During the run-up to Christmas, many events and spectacular special exhibitions in the city further enrich its cultural scene, making it possible for shoppers to truly immerse themselves in the Swiss Christmas spirit. As if the shopping wasn’t enough, visitors can expect overall white Christmas spectacles by visiting St. Gallen – one of the most beautiful Christmas treats of all. Its old town with 16th and 18th century houses is car-free and the snow-covered streets are filled with a soothing atmosphere during the festive season that captivates both the heart and the soul. The town is transformed into a true white Christmas village. About 700 stars shine down on the romantic old town, the streets, as homes and mountains are all magically wrapped in snow. It is definitely worth a visit. There is enough snow to carve out a cross-country track, to go knee-deep snowshoeing, sledding on park paths and even sleighing through St. Gallen. “For those skiers from South Africa, SWISS understands your specific baggage requirement,” comments Dr. Schulz, “and the airline allows our passenger’s skis to be booked in as additional luggage at no additional cost”. Visitors can then burn off the festive culinary delights and indulgences with winter sports in the Eiger and Jungfrau mountains, situated in the gorgeous alpine town of Wengen. Visitors will enjoy breath-taking views and winter activities such as ice skating and tobogganing. They can take the cable car from Wengen village centre, which links to Grindelwald’s ski area or they can take the mountain railway to the Kleine Scheidegg where both ski areas meet. Skiers of all ranks will delight in the expanse of pistes and breath-taking scenery. The white mountains, snowy forests and festive lights turn the town into a real Christmas fairy tale. For visitors travelling with the whole family, Montreux lakeside city is the place to visit in 2017. 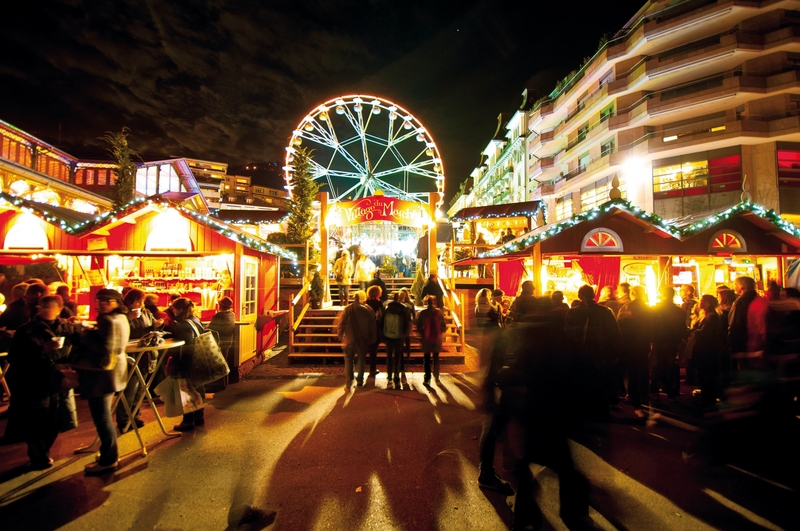 From the end of November until Christmas Eve, the shores of Lake Geneva are lit up by 150 chalets forming the Montreux Christmas Market, and the nearby Lumberjack Village will host stands showcasing traditions from various countries which are set to mesmerise children and adults alike. There is usually a Santa Claus parade in Montreux, whilst in the nearby town of Caux, there’s an enchanting Christmas Village where children get to visit Santa’s workshop, Santa’s Post Office, and the popular elves’ village. After exploring the towns, visitors could find a spot of peace with the Christmas service at the St. Peter’s Church in Zermatt. The St. Peter’s Church has a significant place in Alpine history and has been known to attract many people to its service. According to the International Church Society, in the year 2016 about 800 people attended the Christmas service, and the church was full to capacity with additional chairs being needed. Since its consecration in 1870, thousands of people have passed through the doors of the church, particularly over the Christmas period. A cabinet of botanical curiosities inspired by the year of exploration – Annus Ginibilis!